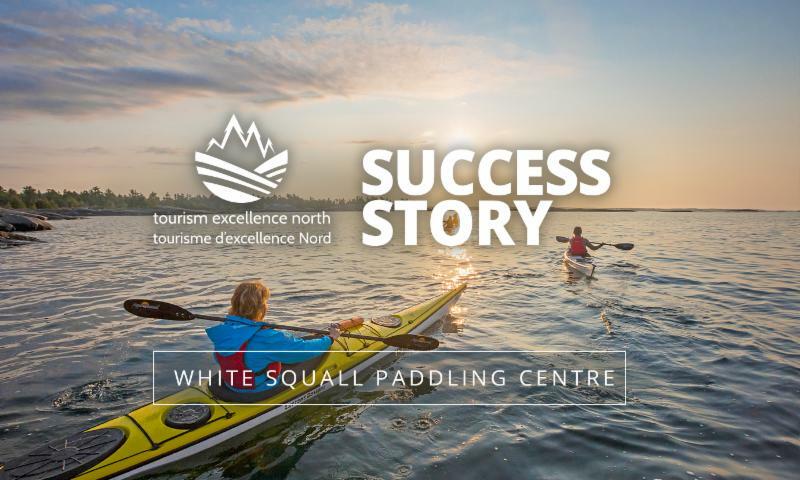 As Kathleen McGill, from White Squall Paddling Centre, discovered – sometimes just a thoughtful shift to a different market can help a business deliver a successful tourism experience. White Squall Paddling Centre was one of Tourism Excellence North’s (TEN) first group workshop participants, way back in November 2016. Kathleen, Office Manager at White Squall, and two colleagues were intrigued by the opportunity to join TEN’s Experiential Travel Training for Operators workshop, hosted in Killarney, ON. The overall intent of this workshop was to inspire Northern Ontario tourism businesses to develop new or enhance existing visitor experiences unique to their own tourism business. Like several other operators who have gone through TEN workshops, Kathleen had already bounced around in her mind the idea of involving local businesses in her tourism experiences. In Kathleen’s case, her target local businesses were in the Parry Sound area. The TEN workshop gave her motivation and validation that she was heading in the right direction with her ideas; the experience framework and coaching from workshop facilitator Laurel Reid allowed Kathleen to put pen to paper and get the ball rolling. By the end of the two-day workshop, Kathleen and the White Squall team had designed a weekend outdoor and educational tourism experience — with kayaking as the anchor. Kathleen’s kayak experience would take advantage of the natural geography and shore line of Georgian Bay and was aptly named the Georgian Bay Fresh Air Escape. Running from a Friday night to Sunday midday, the experience included a Friday night social featuring a screening of TVO’s ‘Striking Balance’, an exploration of Canada’s Biosphere Reserves, a day trip to the Parry Sound Inner Harbour, a locally sourced lunch at the lakeside Glenn Burney Lodge, a painting experience with Jessica Vergeer Studios, a dinner cruise on the Chippewa II and a tour of the Parry Sound and Area Community Apiary. Accommodation and breakfasts were provided by the Bayside Inn. By late Winter 2017 Kathleen began to advertise the experience to run that June. She mainly stuck to Facebook and the White Squall newsletter to keep costs in check. Disappointingly, by Spring 2017, there had only been a few nibbles of interest – not enough to move forward with the experience. Undeterred, Kathleen decided to see if tweaking the experience a bit would help. She was right, and her determination paid off! Kathleen narrowed in on a particular target market – women only – and added to the experience, now called the Girls Weekend Getaway. Modifying the target group was key but changing up the mix of activities – while keeping the price/value in range – was important as well. Kathleen added to the Friday night social Georgian Bay Sprit Co. beverages and two optional activities to the Sunday – lunch and a tour at the newly opened Trestle Brewing Company and an afternoon bike rental and self-guided tour along the Georgian Bay Fitness trail from Parry Sound Bikes. This time, with all the same advertising in place, the June 2018 experience sold out! Kathleen noted that partnerships with local businesses weren’t hard to find – in fact, she is being approached regularly by like-minded businesses looking to partner with White Squall. She notes that while most participants are coming north from the Greater Toronto Area and south from Sudbury, she did have some locals participate in the experience as well. The experience that Kathleen has created attracts those with a range of paddling skills; the participants tend to be ‘outdoorsy’ but not seasoned. White Squall accommodates the range of skills by using tandem boats and breaking up the paddling with the other community experiences and socials. Kathleen says she feels that their price point gives good value for both customer and White Squall but that it took some playing around to get there. She noted ‘It was overall an excellent learning experience, and it was rewarding to have settled on a set of activities that guests saw of value’. White Squall is offering the Girls Weekend Getaway again in June 2019 and are already 40% sold out! TEN is proud to have been a part of this innovative and collaborative experience and is happy to celebrate the success of Kathleen and White Squall! Of course, without White Squall’s initiative, community involvement and determination, the Girls Weekend Getaway would still just be an idea – so hats off to Kathleen and White Squall!